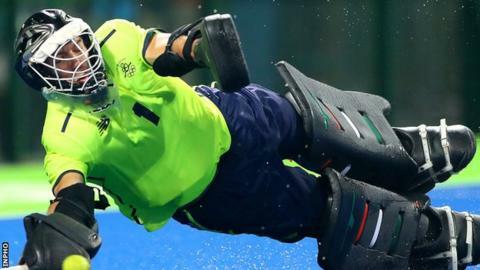 Ireland hockey captain David Harte has been named as Goalkeeper of the Year for the second year in a row. The 28-year-old led Ireland to a first Olympic Games in 108 years in 2016 and said it is an "incredible honour" to win the FIH Hockey Stars award again. "Even to be nominated for a second time was more than I could have hoped for, especially given the world class goalkeepers involved," Harte said. He plays for club side Dabang Mumbai in the Hockey India League. Juan Vivaldi (Argentina), Jaap Stockmann (Netherlands), Vincent Vanasch (Belgium) and Parattu Raveendran Sreejesh (India) were also nominated for the International Hockey Federation (FIH) award, with Vivaldi and Vanasch winning gold and silver respectively at the Rio Games. "Although it is an individual award, it partly belongs to my teams at both club and country level as I would not have made it here without them," Harte added.